At Nominet Trust, we’ve seen the truly transformative effect tech can have on people’s lives from our experience of funding more than 300 projects over the last 10 years. Organisations such as GiveVision demonstrate how tech can massively enhance lives, while ventures such as Alice, are demonstrating how new tech, in this case, blockchain, can be used to help those most in need. Since 2014 we’ve funded seven rounds of Social Tech Seed (STS) – an early-stage funding programme, supporting ventures developing tech to solve society’s most persistent challenges. Here, we focus on the eight ventures funded through the fifth round (STS5), approved in early 2016, to test the core assumptions of the programme. 1. Social tech bridges the gap. The eight STS5 projects all came to the Trust in the early stages of their development, typically with basic prototypes, but some way from having something that could generate revenue and attract further investment. In the period after receiving Nominet Trust support, the STS5 cohort has gone on to secure over £1.5m in additional grants, investments, and revenue after a combined initial investment of £393k from the Trust (see Fig. 6). This represent a multiplier ratio of 1:4.5 from the Trust’s initial Social Tech Seed funding. This figure is continuing to grow, with ventures such as Konnektis generating increasing interest from statutory sector providers. Whilst it’s vital that social tech ventures can generate income and secure investment, the main objective is to have a significant positive social impact. Even though the ventures supported through STS5 were at a relatively early stage there is already evidence that they are transforming lives, with more than 700 people directly benefiting from the services they provide (see Fig 4) – again a number that is continuing to increase month by month. 3. The impact reaches far and wide. Two features of the STS5 cohort that stand out are the diverse range of technologies being used (see Fig. 7), and the wide range of social needs they are being applied to (see Fig 3). For example, Alice, working with St Mungo’s, uses blockchain tech to support homeless people by increasing transparency of charitable giving, while Cafédirect Producers’ Foundation uses SMS tech to underpin IoT tools that will support farmers across the developing world. 4. The right support at the right stage is crucial. Carefully targeted support in the form of grants and professional advice can make a huge difference to early-stage social tech projects – enabling them to develop fully functioning products and services, and unlock significant amounts of additional funding, investment, and revenue. One area of support that appears to be significant is supporting funded ventures to develop and articulate their social business models – including how they will develop and evidence their social, user and financial value propositions. The NT Canvas, developed specifically for this task by Nominet Trust, has proved invaluable. However, there is much more work to be done in developing the social tech eco-system. Whilst there is a growing amount of social investment available in the UK, much of it does not appear to be going to social tech ventures. There appear to be many reasons for this, including a lack of understanding of social tech and perceived risk in supporting ventures that are both tech based and socially focused. The existence of a ‘missing middle’ in the grant and investment landscape is very real and that limits the potential growth and social impact of promising social tech ventures. 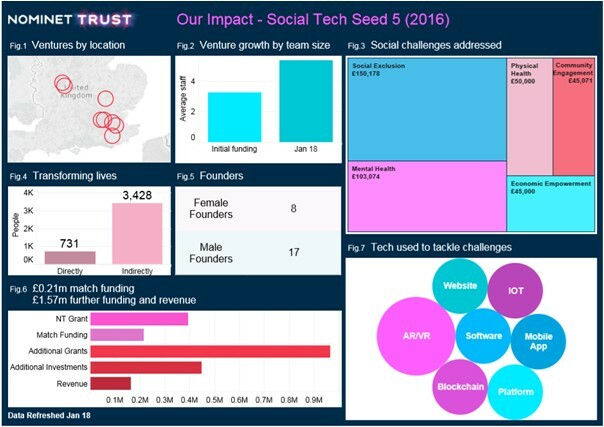 Nominet Trust has acted directly to address this gap through its own Social Tech Growth programme, with 3 of the STS5 cohort (Limitless Travel, GiveVision and Konnektis) receiving a total of £450,000. With their Social Tech Seed grants, these three organisations were able to prove evidence of demand, social impact and potential for growth. Therefore the Trust provided additional growth funding in order to enable them to unlock their full potential. 5. Growth takes time, but it’s happening. Whilst the initial figures around lives transformed (see Fig. 4), team growth (see Fig. 2) and additional funding secured (see Fig. 6) are very encouraging, they all indicate that the supported ventures are still at an early stage of growth and some way from realising their full-scale potential. The ventures that make up the STS5 cohort were approved for funding by the Trust in February 2016, i.e. less than two years ago. At this point, five of the eight organisations approved were less than two years old. Developing a social tech venture to the point that achieves its full potential for social impact takes time, typically five to seven years. MOMO has successfully developed a range of services to ensure that the views of vulnerable young people (e.g. care leavers) are heard and their needs are met. MOMO is now being used by young people and local authorities across the UK and as far away as New Zealand. However, it was originally supported by Nominet Trust in 2012, and has had a long, and at times challenging, journey. The question is where will the STS5 cohort be in three to four years from now? The evidence from STS5 suggests that the core convictions that underpin Nominet Trust’s Social Tech programme are correct. Digital tech (in its many forms) has a huge potential to help address a wide range of social challenges, and carefully targeted support, provided at an early stage, can help unleash that potential. However, STS5 also indicates that there is still a lot of work to be done to ensure that the full social potential of digital tech does not go unrealised. It is also clear that the further investment they need to grow and reach their full social potential is hard to access. What is needed is greater cooperation and communication between investors who understand both the potential and challenges of developing socially driven tech to ensure that the most promising social tech is not wasted, but given the opportunity to transform as many lives as possible. You can read more about our full evaluation of Nominet Trust’s Social Tech programmes here.